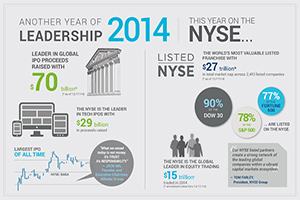 2014 saw the New York Stock Exchange lead the world's markets in global capital raising for the fourth consecutive year. Fueled in part by the largest IPO in history - that of Alibaba which raised $25 billion - it was a landmark year for the NYSE across a range of industry categories including the number and value of tech IPOs, proceeds raised via follow-on transactions, private equity-backed IPOs and the largest REIT and MLP offerings. In addition to industry-leading results, the New York Stock Exchange set an organizational record with 42 combined spin-offs and carve-outs accounting for more than $104 billion in market capitalization. As part of its continued leadership position, the New York Stock Exchange recognizes its responsibility as a stabilizing influence to the markets. Our exertions in this area are taking shape in a simplification effort whereby the NYSE is streamlining the types of orders on offer, reducing structural complexity and extending access to cutting-edge tools and technologies to all market participants. While 2014 was a record-setting year from a financial perspective, our responsibility for and commitment to operating an orderly and transparent marketplace extends through 2015 and beyond.